(blind are we to the fires we started). to beat away these bitter blues? before our season stops to sing. 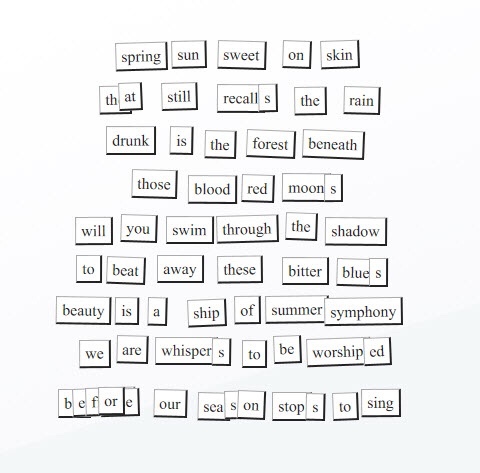 All words by Damien B. Donnelly with the help of the magnetic poetry oracle. Red and blue are the Oracle’s favourite colours. Yeah! Hopefully she was happy today then! She likes getting drunk too. I’ve noticed that. Somebody should have words with her retsina supplier. I’m laughing at the comments here. Nicely done, Damien. Your poem somehow has a fresh power when read on that intimate tablet of the fridge.